Kevin is the regional sales manager for Fifth Third Bank of Greater Indiana and responsible for business banking strategy for clients across Indiana and Kentucky. 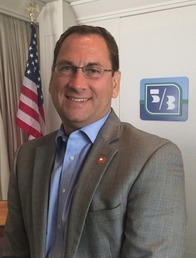 He joined Fifth Third Bank in 2009 as a relationship manager in the commercial division and previously served in a variety of leadership roles with Chrysler Financial LLC during his 17-year career with the company. He has 26 years of experience in improving operational efficiency, promoting job creation, and planning for business succession. Kevin coaches clients in areas that improve profitability and provide long-term stability and growth. He continues to nurture his passion for coaching and team leadership in his current role leading a team of bankers who provide financial solutions to small to mid-size companies. Kevin earned a bachelor’s degree in finance from the University of Missouri located in his hometown of Columbia. He also earned a Master of Business Administration in Management from Webster University in Kansas City, MO. He married his high school sweetheart, and the couple has two sons. The family has lived in Carmel, IN since 2009 and remains active in youth sports, volunteerism and their church, Our Lady of Mount Carmel. Kevin is also a member of the Indiana Certified Development Company, which specializes in Small Business Association loans and other services for small businesses. He volunteers each Thanksgiving to serve a holiday dinner to needy families in Carmel.